Ballymore Stables will be represented by two runners in the Barfoot & Thompson Group 1 Auckland Cup over 3200m on Wednesday with Group 3 Waikato Gold Cup winner Surpass (pictured) and Group 2 Wellington Cup winner Graphic. Surpass has come through an encouraging performance in the Listed Kaimai Stakes over 2100m two weeks ago and is looking spot on for Wednesday’s assignment. “He’s trained on well and we are confident he is going to make his presence felt,” co-trainer Chad Ormsby said. “59kg is not ideal, and he gives a few runners a lot of weight, but he is a class act and his two runs at Ellerlslie this preparation have been full of merit. Surpass will be partnered with jockey Michael Coleman and has drawn barrier nine. The second runner is last year’s Group 2 Wellington Cup winner Graphic who has come through his Avondale Cup run in great order and Ormsby believes he is a very strong chance. “His preparation has been mixed, but don’t write him off,” exclaimed Ormsby. 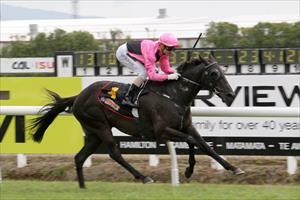 Graphic will be ridden by inform jockey Matthew Cameron and has drawn barrier 18. Talented sprinter, Spitfire Lady, will also join the duo on Auckland Cup Day as she contests the Group 3 Westbury Stud Classic for fillies and mares over 1400m. “She’s had a wee freshen up and she can race very well in that state,” Ormsby said.